This week I'm working on my hit list, and simultaneously taking one more step toward finishing another WiP. When quilt basting, I use a combination of 505 spray, and curved safety pin. 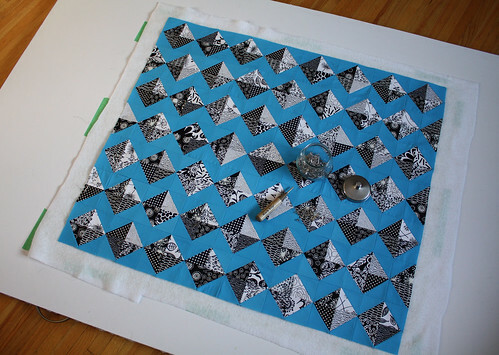 My trusted Kwik Klip tool is always a staple when pinning a quilt sandwich, and I find it speeds up my basting time significantly. 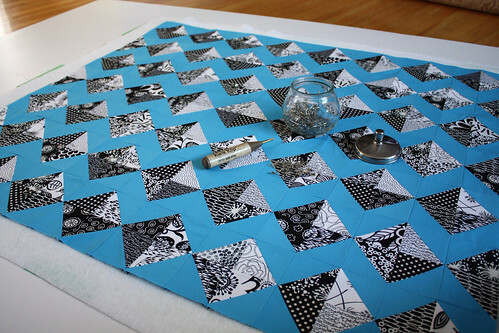 I'm on the road this week so I don't know if I'll find time to finish the quilting of this baby quilt right away, but I'm making it a priority next week. 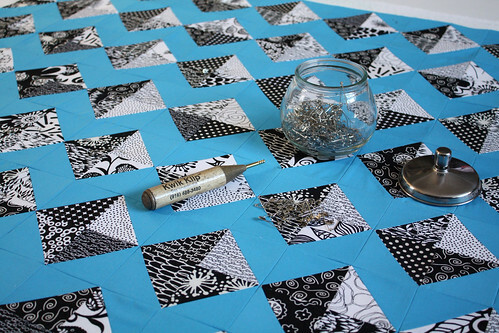 You can read more on this Black and White Kites quilt top, here and here. It's really gorgeous Kelsey. I love the black and white prints, on the bright background. I'm curious what your basting process is, using spray and pins. I tend towards one or the other, lately most often pins unless it's a really small project.